DS Fire Emblem: Shadow Dragon (USA) in 12:05.84 by Vykan12. 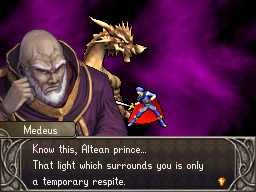 Fire Emblem: Shadow Dragon is the second remake of the original Fire Emblem, and the first Fire Emblem game for DS. The story follows the Altean prince Marth on a quest to win back his home kingdom and save his kidnapped sister. Characters and chapters that were omitted in the original game and the first remake were introduced in this title. In this run, Vykan12 uses speedy strategies, lots of luck manipulation, and an infinite-range warp staff to beat the game in record time.